PREDAT is a banker plant. A banker plant provides alternative food source for beneficial insects and a reproduction site for them. PREDAT is the combination of native Artemisia and native Artemisia aphid. The Artemisia aphid is monophagous. Monophagous means that the aphid feeds on only one plant species. Therefore Artemisia aphid stays on Artemisia and does not go onto other plant species. 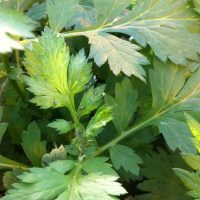 The cent of Artemisia attracts the Artemisia aphid as well as the predators of aphids, as for example hoverflies, parasitic wasps, ladybirds, lacewings and many others. The predators eat some of the Artemisia aphids and lay eggs on the leaves or in the neighbourhood. This means that the predators multiply on the Artemisia. If enough PREDAT is planted beside the crops, native predators are attracted and multiply several times and create a lot of divers predators. These young predators spread onto the crop searching for prey (aphids). That PREDAT is working very well has been proved in crops with a project in The Netherlands with producers of tulip, narcis and lily bulbs. The fields surrounded with PREDAT had less aphids than the conventional fields sprayed every week with insecticides. 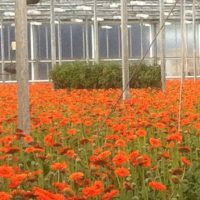 PREDAT is currently used in The Netherlands in nurseries and greenhouses and biological vegetable seed production. PREDAT is produced by Servaplant and sold in trays of 45 plants. 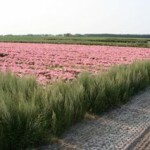 A minimum of 200 plants per hectare is needed for good effect. PREDAT must be applied in a special way to work well. Please contact us for proper information. Copyright © 2019 Servaplant. Powered by WordPress. Theme: Accelerate by ThemeGrill.